Desmond Collins, "Paradise Revisited", Rotunda, Vol. 19, No. 1, pp. 30-39, Summer 1986. Surprisingly (to me), many of the creatures revealed have still not been properly described – including the one called the 'Collins monster'. An interesting feature of many Cambrian lobopodians, and perhaps a primitive condition for panarthropoda as a whole, are the paired sclerites or miniature armour plates, symmetrically arranged along the trunk, mostly in pairs dorsally positioned to the walking limbs. These show a general net-like microstructure, which has been described for Hallucigenia, Onychodictyon and Microdictyon, and also found in other genera such as Cardiodictyon, Luolishania (= Miraluolishania? ), and "Collins monster". A number of lobopodian species (Microdictyon, Cardiodictyon, Hallucigenia, Onychodictyon, Luolishania, Miraluolishania, “Collins monster”) that are closely allied with the onychophorans have sclerotized sclerites that are symmetrically arranged along the trunk, mostly in pairs dorsally positioned to the walking limbs. 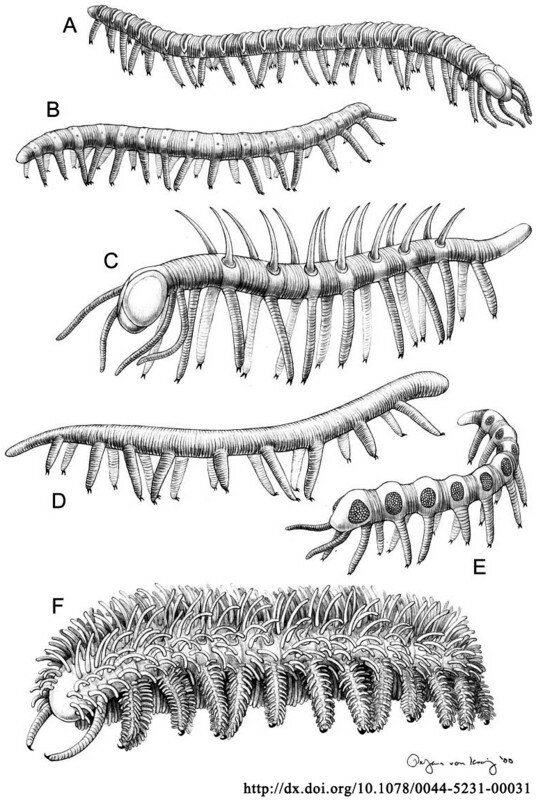 Eyes have been noted in lobopodian taxa from the Burgess Shale Lagerstätte: Collins (2002) mentioned the presence of eyes in Hallucigenia sparsa; and a pair of dark, clavate structures on the dorsolateral part of the head of “Collins’ monster” (Collins, 1986; photograph p. 39; Delle Cave and Simonetta, 1991) are appropriately positioned for eyes. When known eye structures are plotted on this cladogram (Fig. 6A), four evolutionary stages may be postulated: the first panarthropod eyes were possibly simple pigment cups, similar to those in extant tardigrades (Greven, 2007); in a second stage, multi-layered lens-bearing, rhabdomeric eyes developed, as are generally shared by onychophorans and euarthropods; thirdly, the entire eye multiplied to produce at least two visual units, as in L. longicruris and H. fortis (an hypothesis that predicts that other members of the clade [Cardiodictyon + Hallucigenia + Onychodictyon + Luolishania + Collins’ monster] also possessed multi-unit eyes); finally, the loose visual units became contiguous and further modified to form typical arthropod compound eyes. However, if we plot the eyes on an alternative topology by Legg et al. (2011; Fig. 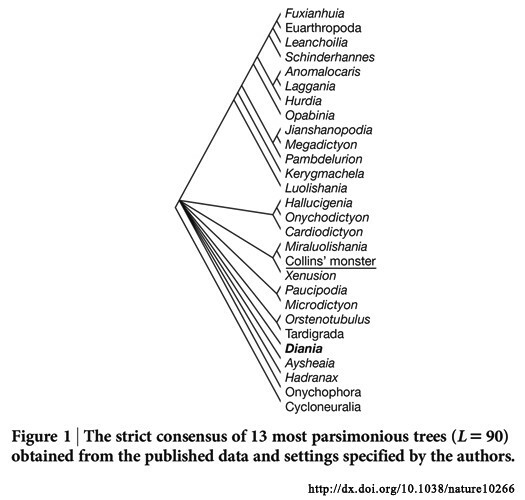 6B), this transformation series becomes obscure, as the phylogenetic positions of many Cambrian lobopodians are unresolved in this tree. A distinctive group of lobopodians known from Cambrian Stage 5 in western Laurentia includes Acinocricus Conway Morris & Robison, 1988, from the Spence Shale in Utah, and an unnamed species from the Burgess Shale, British Columbia, popularly known as ‘Collins’ monster’. The temporal gap from their closest relative, the Chengjiang lobopodian Luolishania, is bridged by a single, incomplete specimen of a Collins’ monster-type lobopodian from the Emu Bay Shale (Cambrian Series 2, Stage 4), Kangaroo Island, South Australia, the first lobopodian discovered in this Konservat-Lagerstätte. 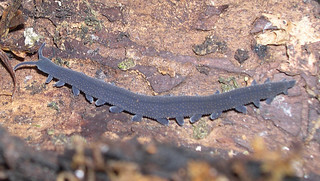 Pending formal description of the Burgess Shale species, the Australian specimen is left unassigned to a genus. The Burgess Shale itself includes familiar species of Aysheaia and Hallucigenia (Conway Morris 1977, Whittington 1978, Ramsköld 1992), but also a few species that have not yet been formally described or named. Most relevant to the present study is an armoured lobopodian figured in a popular article by Collins (1986, p. 39) as a ‘spiny animal with hairy legs’. The latter animal was reconstructed (on the basis of Collins’ photograph) by Delle Cave & Simonetta (1991), and informally called ‘Collins’ monster’, a nickname applied to it in subsequent literature on Cambrian lobopodians (e.g., Ramsköld & Chen 1998, Ma et al. 2009, 2013, Liu et al. 2011). Collins’ monster has been recognized as a close relative of the Chengjiang lobopodian Luolishania longicrurus (Ma et al. 2009, Liu et al. 2011) and was also suggested to be especially closely allied to Acinocricus stichus Conway Morris & Robison, 1988, a species from the Spence Shale (Cambrian Series 3), Utah (Ramsköld & Chen 1998). 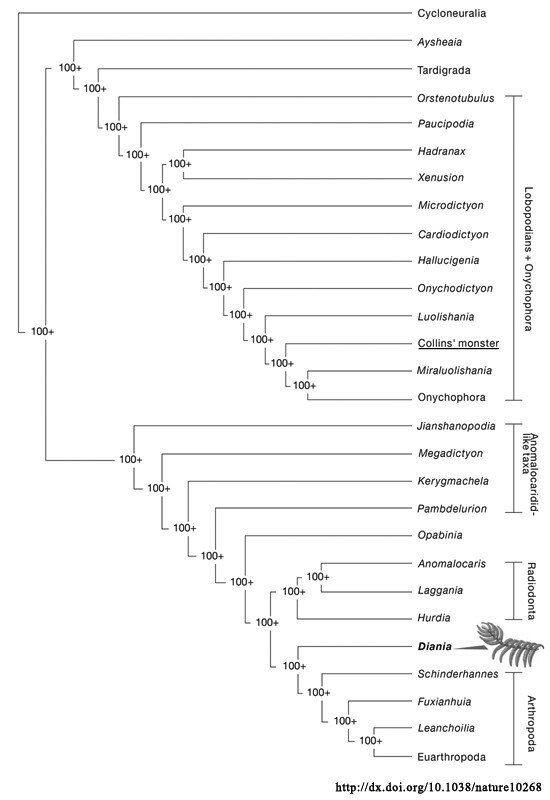 All of these Cambrian lobopodian species share multiple (three or more), long, curved spines arranged as segmental rings along the trunk. Their anterior five (in Luolishania) or six (in Collins’ monster) pairs of lobopods are longer than the lobopods in the posterior part of the trunk and are composed of a large number of annulations, each of which bears long spines or spiniform setae. Herein we document a single specimen of a lobopodian from the Emu Bay Shale Konservat-Lagerstätte that belongs to the group including Acinocricus and Collins’ monster, demonstrating that this clade is not limited to Cambrian Stage 5 in western Laurentia, but also includes earlier diversity in Gondwana. 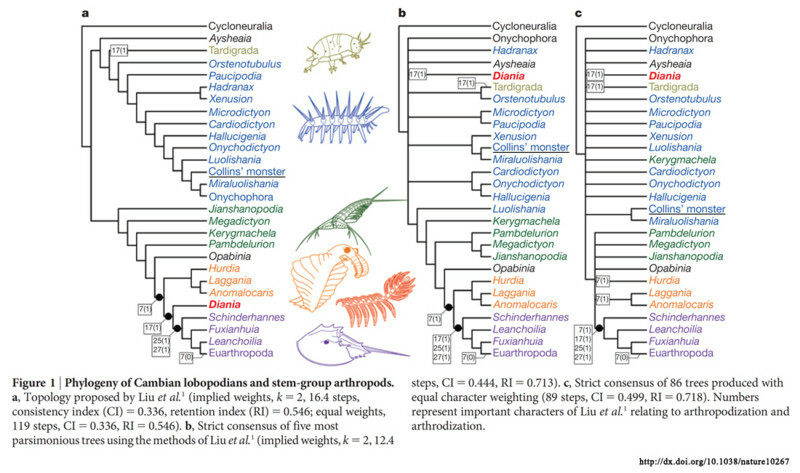 Cambrian lobopodians had until now been represented in Australia only by isolated plates of Microdictyon (Bengtson et al. 1990, Topper et al. 2009, 2011). Laura Delle Cave and Alberto M. Simonetta, "Early Palaeozoic arthropods and problems of arthropod phylogeny; with some notes on taxa of doubtful affinities", in The Early Evolution of Metazoa and the Significance of Problematic Taxa, eds Alberto M. Simonetta, Simon Conway Morris, Cambridge University Press, Cambridge, pp. 189-244, 1991. Above: What is it? This new spiny animal (4 cm) with hairy legs has a body plan that has not been seen before. Dzik (this volume) has proposed a reconstruction of Xenusion pompecki (Fig. 32) This shows some remarkable similarities to Aysheaia. There are also differences, especially in the well developped but sparse dorsal spines implanted on rather large sclerites, and in the fringed appearance of the appendages. 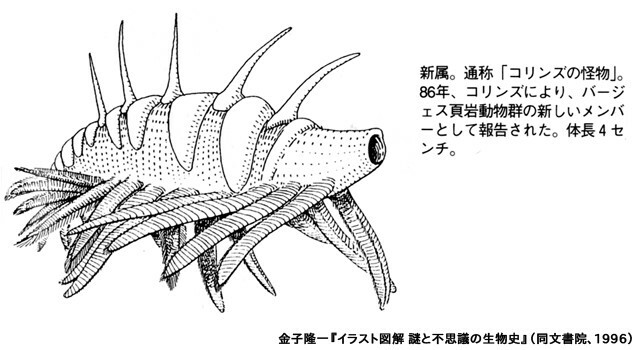 Both features strongly recall a new animal from the Burgess shale recently figured by Collins (1986). It is obviously rash to discuss the affinities of this latter animal on the evidence of a single photograph, so the following remains tentative. We suppose that the dorsal spines are correctly identified and not outstretched right legs protruding beyond the body. The legs, with their double set of inner, delicate spines, are suggestive of a specialization on the basic pattern of the first pair of appendages of Aysheaia. 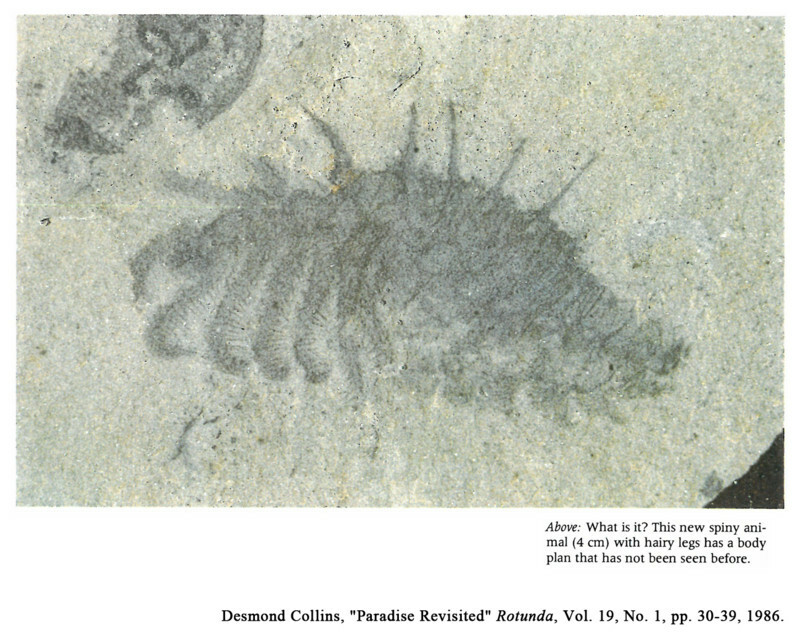 However the first appendages of a small specimen of Anomalocaris would also look much the same. At the front end of the animal Collins’ (1986) photograph appears to show a structure conceivably comparable with the circumoral structures of Aysheaia, while the caudal half of the animal seems to show some sort of “pleural-like” folds or of matted fringes of the appendages. These, if pleural folds, would recall, Anomalocaris, if fringes, may be like those of Xenusion. All taken, it seems worth considering the possibility that this animal is close to Xenusion. 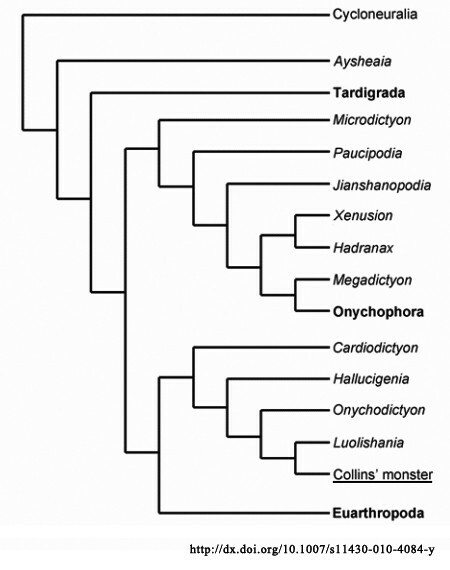 This genus may prove to belong to the lineage leading to Aysheaia and the Onychophora-Tardigrada ensemble, with Collins’ animal representing yet another branch of the basic radiation of α-chitinate animals. 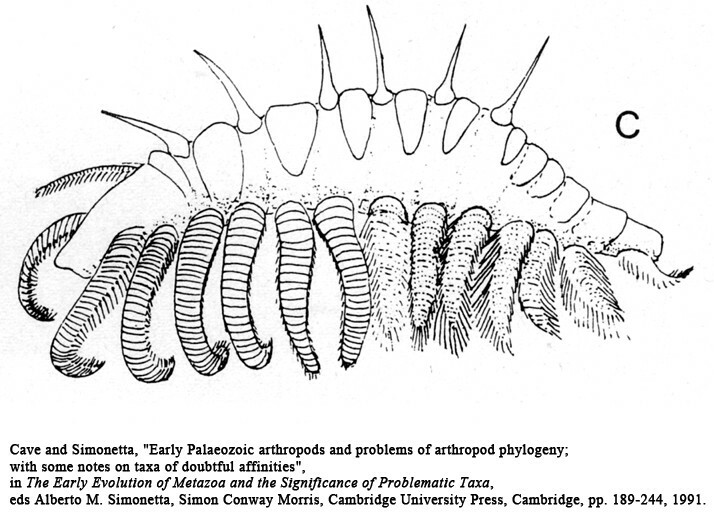 Cave and Simonetta, "Early Palaeozoic arthropods and problems of arthropod phylogeny; with some notes on taxa of doubtful affinities", 1991. Jie Yang et al., "A superarmored lobopodian from the Cambrian of China and early disparity in the evolution of Onychophora", PNAS, 2015.